Polish those crane kicks, for the iconic '80s rise-and-rise-higher flick is turning 35. Happy 35th anniversary, "The Karate Kid": The '80s classic waxes on, waxes off in local cinemas on March 31 and April 2, 2019. If you grew up in the '80s, or started living life after the '80s, or were a youngster long before the '80s, and you adore movies about bettering one's self through discipline, positivity, can-do, commitment, and the power of friendship, then you have crane-kicked, once or twice. And swept the leg. And maybe crane-kicked after sweeping your leg. And you probably did this all on a beach, because if you love "The Karate Kid," it's almost impossible to stand on a sandy shore, facing the ocean, without raising your arms, Ralph Macchio-style, in the dramatic manner of a crane's wings. The '80s feel-good flick is turning 35 in 2019, and, to mark the Macchio-major, Morita-marvelous moment, Fathom Events is helping bring it back to the big screen, for two days. Those days are March 31 and April 2, and plenty of Southern California cinemas are showing the film, including LA Live 14 and AMC Century City 15. Sony Pictures is a partner on this nostalgia-nice re-release. 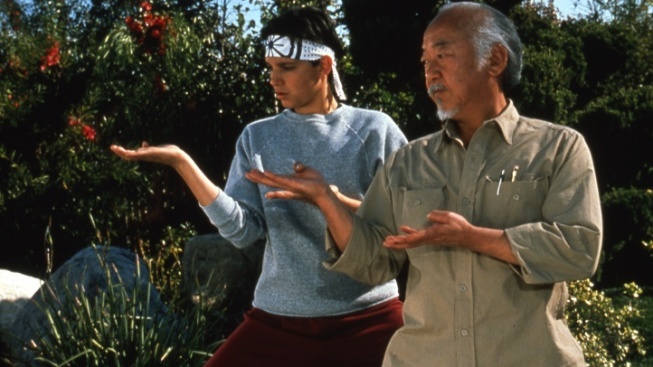 But the feelings evoked by the film, by the bond between Daniel and Mr. Miyagi, are not of the wayback variety. We still feel, quite keenly, Daniel's commitment to learning the poses, the lessons, and how to face his fears. Starring alongside Ralph Macchio? The great Pat Morita, of course. Don't wax on, wax off just yet, for there's an additional treat for those fans who catch the film in theaters on March 31 and April 2: A new retrospective, in 4K HD, featuring Ralph Macchio as well as actors William Zabka, and Martin Kove.